Somehow, I forgot to post the design I created for What the Dickens: Victorian England in the A.M. Todd Rare Book Room, the fall 2013 exhibit for the A.M. Todd Rare Book Room at Kalamazoo College. The exhibit ran from September 16-November 26, 2013, and participated in October 4th Art Hop. The illustration featured in publicity was Leslie Ward’s Caricature of Dickens (1870). Leslie Ward was a British caricaturist, who was about 19 years old when he made this drawing. John Gould’s Glories: Hand-Colored Illustrations is the fall 2014 exhibit for the A.M. Todd Rare Book Room at Kalamazoo College. The exhibit runs from September 15-November 25, 2014 and will participate in the November 7th Art Hop. The illustration featured is “Nyctea Nivea”, a plate from John Gould’s The Birds of Great Britain, London, 1862-1873. To be honest, I really didn’t consider any other artwork to feature for this exhibit. Once I saw this plate, the choice was easy. I looked at many other illustrations, but this was always number one . I photographed the artwork using the Canon T2i with a EF 35mm f/1.4L USM. Personally, I think this is a spectacular wide-angle lens. Sincerely Yours: Noteworthy Signatures from the A.M. Todd Rare Book Room Collection is the spring 2014 exhibit for the A.M. Todd Rare Book Room at Kalamazoo College. 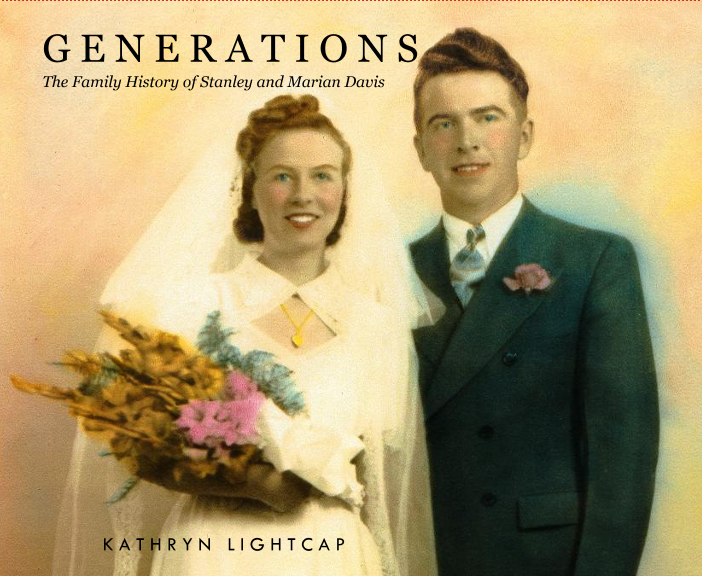 The exhibit runs March 31 – June 5, 2014. The exhibit participated in the Friday, April 4th Art Hop, sponsored by the Arts Council of Greater Kalamazoo. I struggled with this design. The rare book room curator is showcasing signatures from notable figures. Translating signatures into a promotional piece was challenging. I thought about showcasing individual signatures, but discarded it because many are illegible. The signatures are notable, but how effective can they be if nobody can read them? Also, I decided it was a mistake to assume people would recognize the names without providing context. In the end, I decided to add a single ornamental letter to the exhibit title. One ornamental letter wouldn’t break branding requirements. The swirls in the ornamental letter are used as a subtle graphic element throughout the rest of piece. Flying Gems: Hummingbirds by John James Audubon and John Gould is the winter 2014 exhibit for the A.M. Todd Rare Book Room at Kalamazoo College. The exhibit runs from January 6 – March 14, 2014 and will participate in the January 10th Art Hop. I considered two pieces of artwork drawn by John James Audubon for the exhibit: Anna Hummingbird, Hibiscus Virginicus and Ruff-necked Hummingbird, Cleome heptaphylla. In the end, I chose Anna Hummingbird to feature on the poster and postcard. Why? It fit better with my vision of the piece and the full image worked for the poster, and cropped nicely for the postcard. Usually, I photograph artwork using the Canon T2i. However, for this design I ended up scanning the artwork. I couldn’t get the detail that I desired with my lens. I recently finished designing the postcard and exhibit poster for K 180: Celebrating Kalamazoo College’s 180th Birthday. It features gems from the A.M. Todd Rare Book Room collection. The exhibit runs from April 1 – June 13, 2013, at Kalamazoo College, and is closed between May 8 – May 19. The exhibit will be featured in three Art Hops sponsored by the Arts Council of Greater Kalamazoo. Art Hop occurs the first Friday of the month in downtown Kalamazoo, and this exhibit shows in April, May and June. The artwork I chose to feature on the publicity materials is from an illuminated manuscript copy of Edgar Allan Poe’s “The Raven,” which was a birthday gift in 1920 to Albert May Todd from his wife Augusta. As usual, I photographed the artwork using a Canon EOS Rebel T2i. Religious Reflections: Selections from the A.M. Todd Rare Book Room Collection features Giclée prints from The Saint John’s Bible along with other religious selections. 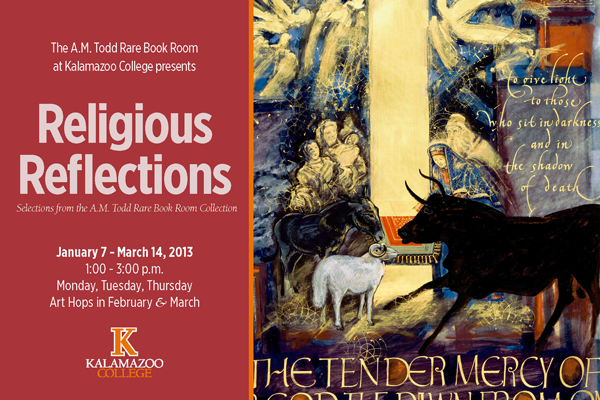 Exhibit in the A.M. Todd Rare Book Room at Kalamazoo College, January 7 – March 14, 2013, and will be part of Art Hop, a program of the Arts Council of Greater Kalamazoo, on the first Friday in February and March. Interestingly, I could not submit Birth of Christ artwork for use for the Art Hop brochure. The Saint John’s Bible has very strict use guidelines, so another religious selection is featured in that brochure. I also needed approval from The Saint John’s Bible before sending the artwork to print. The following guideline made me pause when I first read it: “No modification of the image is allowed including writing, logos or printing of any sort placed on, around, or under the image, including decorative borders.” I wondered how strict an interpretation would be taken, but the designs (after a small revision) were approved so all went well! The Saint John’s Bible’s calligraphy and illuminations are amazing, and I encourage everyone to learn more. I designed this poster for Art, Social Justice, and Critical Theory: Speaker Series, Artistic Performances and Spring Conference at Kalamazoo College. View Art, Social Justice, and Critical Theory PDF. I redesigned the guide that describes the assistance Information Services at Kalamazoo College provides their students.